Sheila was born in London and went to University in Birmingham but has spent 30 years living and working in Gloucestershire. 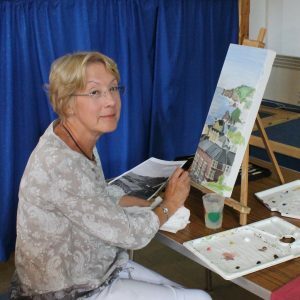 Art and crafts have been favourite hobbies since childhood but since moving to Devon a year ago, she has concentrated on painting mainly in acrylics and enjoys exploring different styles and subject matter. To look at Sheila’s work click on a image below and a slideshow will open.The i button below each picture can be switched on/off.